Known for its truffles and fois gras, Périgueux is also the préfecture (government center) of the Département of the Dordogne. 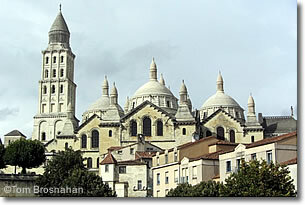 Périgueux, on the banks of the River Isle 49 km (30 miles) north of Bergerac (map), is dominated visually by the spires and domes of its huge Cathédrale St-Front, but what dominates in the minds of connoisseurs is the place St-Louis, with its market for fois gras and truffles. A thriving town in ancient times, Périgueux was a backwater until 1790, when it was designated the Préfecture of the département of the Dordogne. Its two old city centers, La Cîté and Puy-St-Front, have the usual narrow medieval streets and squares, but otherwise Périgueux exudes a modern bustle, activity and aspect. Because it has a number of hotels, you can use Périgueux as a base for exploring Périgord blanc and its cuisine, though more convenient bases (such as Sarlat) exist nearer the center of what most visitors want to see.